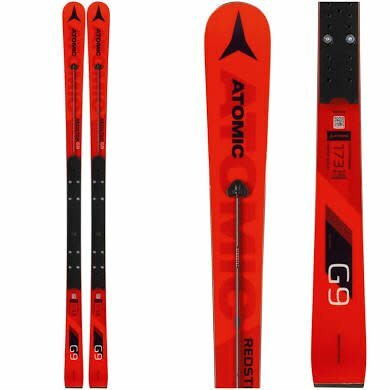 The Atomic Redster G9 FIS is a high powered race ski for turning and burning on the race course. The Atomic Redster G9 FIS is a high powered race ski for turning and burning on the race course. Atomic's Servotec Construction has a free standing structure on topsheet of the ski that adds a powerful rebound and stability. The Servotec Rod connects to an elastomer underneath the binding platform that dampens out vibrations and improves steering around the gates. The Titanium Powered Ultra Power Woodcore adds unmatched stability delivers a damp and smooth feeling. Atomic's Active Flex Interface is only compatible with Atomic X Var Bindings (sold separately) and allows the ski to flex naturally with improved edge grip on a firm course. Active Camber only adds to the grip, precision and rebound of this beast of a race ski.